Members of the U.S.-backed Syrian Democratic Forces (SDF) dance a traditional Syrian 'Dabka" as they celebrate in front of stadium that was the site of Islamic State fighters' last stand in the city of Raqqa, Syria, Oct. 20, 2017. The U.S.-led coalition against the Islamic State has been able to decimate the terror group's self-proclaimed caliphate in Iraq and Syria but these gains could be easily undercut by continued instability, a U.S. intelligence official warned Tuesday. “Even if these do not lead to the group’s resurgence, fears of reprisals and Sunni grievances due to political marginalization, discrimination, and delays in reconstruction may hamper the reconciliation necessary for a sustained peace, which is a key U.S. objective," he said. Last Thursday the Iraqi Prime Minister Haider al-Abadi issued a decree formalizing the incorporation of the Shiite paramilitary group into the country's official security forces. 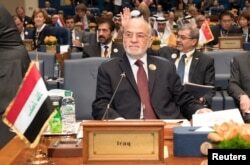 Iraq's Foreign Minister Ibrahim al-Jaafari attends the Kuwait International Conference for Reconstruction of Iraq, in Bayan, Kuwait, Feb. 13, 2018. An international conference in Kuwait last month collected about $30 billion mostly in credit facilities and investment to help rebuild Iraq's economy and infrastructure. But that amount felt short of Baghdad's appeal which said it needed $88 billion to recover from three years of war.